Book-Bass Bug Fishing, by William Tappley, Before bass boats, cable television, and big-money tournaments, anglers pursued bass with fly rods and large flies made of deer hair. 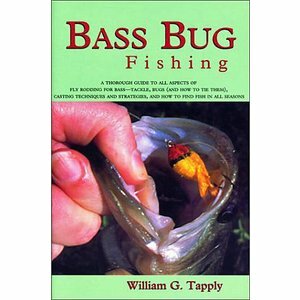 Book-Bass Bug Fishing, by William Tappley, Before bass boats, cable television, and big-money tournaments, anglers pursued bass with fly rods and large flies made of deer hair. In his first angling how-to, Tapply, fishing essayist and author of the Brady Coyne mysteries, introduces anglers to the bass bug revival. He eloquently explains the pleasures of bass bugging and offers a fascinating history of the technique, used by Native Americans before the arrival of Europeans. 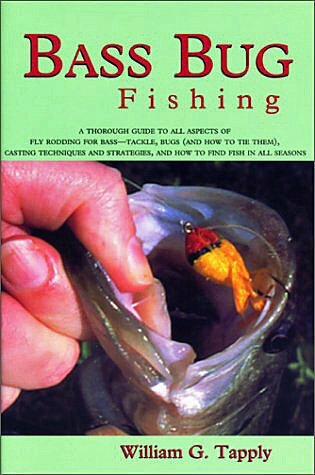 He also covers such specifics as how to tie 10 bass-bug fly patterns; how to cast and retrieve these very large flies; and what equipment and tackle are required. The bulleted arrangement of the text occasionally gets in the way of Tapply's clear and congenial prose, but the value of the information outweighs the sometimes awkward presentation. 164 page Hardcover edition. 6 x 9 inch format.